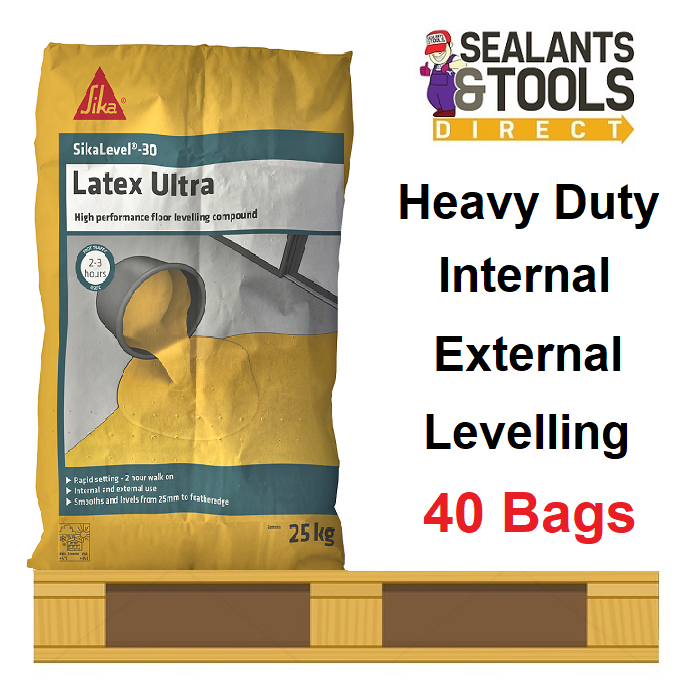 SikaLevel 30 Latex Ultra is a ultra high strength high performance, Latex modified cement based powder, which when mixed with water, can be used to level out uneven floors and screeds internally. It is also suitable for some exterior applications such as sheltered balconies and walkways, prior to laying ceramic tiles, slabs and natural stone. SikaLevel 30 Latex Ultra can be overlaid with common floor coverings or left as a final wearing surface. Sika Level 30 Latex Ultra will even accept light vehicular traffic. May be applied in one coat from 2 to 10mm in depth (25mm when filled). Typical surfaces include concrete and screed, existing unglazed ceramic tiles, brick, stone etc. When mixed as directed, the compound provides a free flowing mix that may be walked on in 2-3 hours and can be overlaid with ceramic tiles after only 3 hours at normal temperatures. when overlaying with other floor coverings allow 24 hours drying time for each 10mm depth. For levelling and smoothing concrete and screed floors where a heavy duty floor topping is required. Wet or humid rooms, such as bathrooms, SikaLevel-30 Latex Ultra should be covered with a damp proofing membrane such as SikaBond Rapid DPM. Switch off any underfloor heating systems 24 hours before and after application. Ensure floor temperature is >5°C. Floors to be treated must be free from grease, dust and loose particles. Existing concrete screeds must be a minimum of 4 weeks old before applying this product. Always prepare floors by dampening with water then priming with PVA diluted 1 part PVA to 3 parts water to give a sound, slightly damp surface. Internally surfaces should be primed using Everbuild PVA Bond. Externally surfaces must be primed using Everbuild SBR Bond. Always See Datasheet regarding priming. 25kg of Sika-Level-30 mixed with 5 litres of water will cover approximately 5m2 at a depth of 3mm depending on substrate .